Call of Duty: WWII’s release on November 3 marked a welcome return from outer space and back to classic historical warfare, but the joy of returning to the trenches has been marred by a boatload of issues. At launch, the game had constant server issues that took the game offline at various times and across all platforms. There were issues loading into the Headquarters social space, getting stuck on black screens or loading screens, and random disconnects from matches or a party. 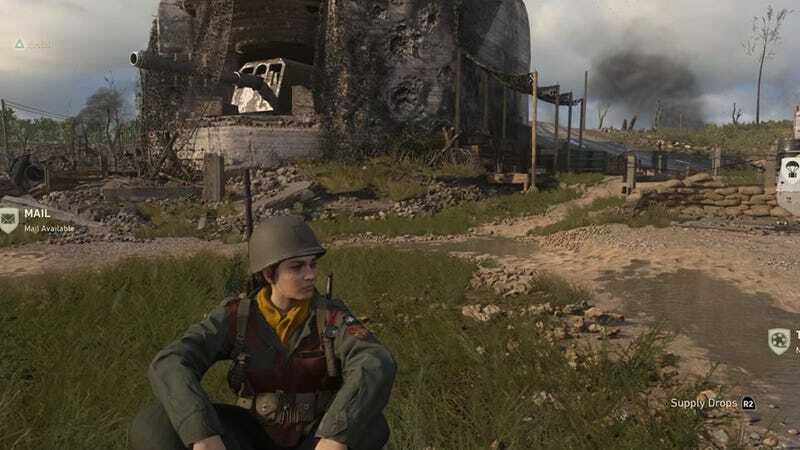 As a short-term fix for this, Activision disabled the social elements of Headquarters, restricting it to a single player or hand-picked group of friends. It’s a pretty lonely place. Some players even had their hard-earned ranks reset. While that hasn’t happened to me—yet— I have experienced awkward load times between matches that wouldn’t allow me time to do anything before the next match started. It literally froze me until a new match started. It becomes even more frustrating when partying up with friends. If you have a full party of six, that’s 6x the freezing and disconnect issues. We literally have to regroup after almost every match, and just regrouping and trying to reconnect to each other is a tiring task. The hit detection in multiplayer varies, ranging from decent to horrendous Black Ops 1-era hit detection in which you watch in frustration as, where you watch people kill you even though their crosshairs are nowhere near you in the killcam. Over a week since launch, and after two major patches, things still aren’t fixed. Unfortunately, you couldn’t see much of a difference in quality after that patch. There was still a plague of black screens or freezing on the scoreboard after a match was complete. Party members still got booted during or between matches. Even worse, after the patch you didn’t always load into the same match as the members of your party. On more than one occasion, we had party members who were stuck in the Headquarters, or in a completely different game. On the same day as the patch, developer Sledgehammer Games took the game’s dedicated servers down, making the multiplayer function with only peer-to-peer hosting as they worked to create more stable dedicated servers. The developers advised that the dedicated servers would remain down throughout the weekend as they continued tests. Today, November 13, gifted us with a new patch in the early hours of the morning—but players are still facing disconnect issues and black screens. In my initial testings of the post-patch game, I can say that WWII is performing better for me, but it’s not fixed. I haven’t personally experienced any black screens since this new update, but a few teammates still got stuck with them at the end of the matches. The load times also feel faster, and I’ve only gotten stuck on a scoreboard once. Prior to the latest update, I was getting a black screen or stuck on the scoreboard after almost every single match. Call of Duty is the game that brings all my closest friends back together for some multiplayer fun, and I’d love to experience a night of playing where we don’t have to regroup after almost every match. These online issues are hurting an otherwise polished game, one that we think could be the best entry of the franchise in years—if only we could play it the way it’s intended.